Utilizzando questo comando avvierete una procedura, via internet, che verifica la disponibilità di aggiornamenti e/o nuovi prodotti compatibili con la vostra Suite. Ricordatevi che per un corretto funzionamento di questo comando dovrete essere connessi ad internet. In alto, un testo vi comunica se sono disponibili degli aggiornamenti, subito sotto, a sinistra, una lista degli aggiornamenti disponibili. Sulla parte di destra, dei testi informativi vi terranno aggiornati sulle novità di Cigraph, o vi descriveranno le caratteristiche degli aggiornamenti selezionati dall’elenco di sinistra. 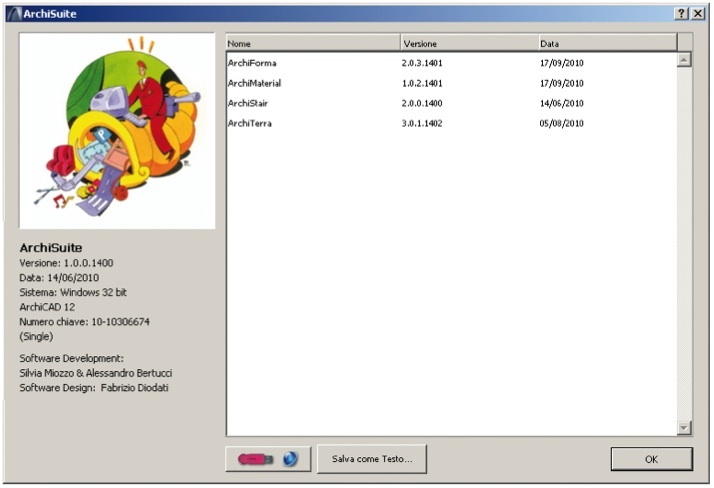 Utilizzando il pulsante Download dei Plug-ins… vi connetterete alla pagina web da cui potrete scaricare gli aggiornamenti relativi alla versione di ArchiCAD da voi utilizzata. Se questa opzione è attiva, allora ArchiSuite controllerà automaticamente, ad intervalli di tempo predefiniti, se sono disponibili degli aggiornamenti per prodotti da voi utilizzati. Se l’opzione non è attiva, allora dovrete utilizzare manualmente i comando Controlla aggiornamenti…, descritto in precedenza, per verificare se sono disponibili degli aggiornamenti per i vostri prodotti. A sinistra, sotto il logo di Cigraph Factory, le informazioni relative ad ArchiSuite e alla vostra chiave hardware. 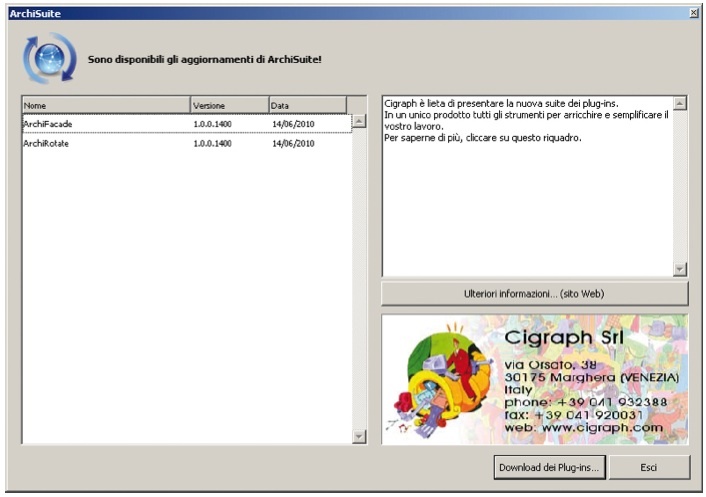 L’elenco a destra, lista tutti i plug-ins Cigraph installati, le loro versioni e le loro date di rilascio. Nel caso riscontraste qualsiasi tipo di problema con in nostro software, l’invio di queste informazioni al nostro Supporto Tecnico faciliterà e velocizzerà l’intervento della nostra assistenza tecnica. Usate il pulsante Salva come Testo… per registrare un file che contiene tutte queste informazioni da spedire via e-mail al nostro Supporto Tecnico. A sinistra, il pulsante con l’icona della chiave ed un piccolo mondo, vi consente di connettervi alla pagina web per la programmazione della chiave hardware Cigraph. I just want to say I am newbie to weblog and truly loved your page. More than likely I’m planning to bookmark your blog post . You surely come with wonderful writings. Thanks a lot for sharing with us your web-site. I¡¦ve been exploring for a little bit for any high-quality articles or weblog posts on this sort of space . Exploring in Yahoo I ultimately stumbled upon this web site. Studying this info So i¡¦m satisfied to show that I’ve an incredibly just right uncanny feeling I discovered exactly what I needed. I most certainly will make certain to do not put out of your mind this site and provides it a glance on a relentless basis. I do consider all of the concepts you’ve presented to your post. They’re really convincing and can definitely work. Still, the posts are very quick for novices. May just you please lengthen them a bit from subsequent time? Thank you for the post. I¡¦ll right away clutch your rss as I can not find your email subscription link or newsletter service. Do you’ve any? Please allow me realize in order that I may just subscribe. Thanks. Thanks for sharing superb informations. Your web-site is very cool. I’m impressed by the details that you have on this site. It reveals how nicely you perceive this subject. Bookmarked this website page, will come back for more articles. You, my friend, ROCK! I found just the information I already searched everywhere and simply couldn’t come across. What a perfect website. Keep up the wonderful piece of work, I read few posts on this site and I think that your blog is real interesting and holds lots of good info . Needed to post you the little bit of remark to help give many thanks as before on the incredible concepts you have documented in this case. It is really seriously generous of you to allow openly exactly what most people would’ve sold as an e-book in making some cash for themselves, especially now that you could have tried it in the event you wanted. Those techniques additionally served to become great way to understand that the rest have the same dreams just like my own to find out very much more around this problem. I believe there are millions of more enjoyable situations in the future for individuals that see your site. Hiya, I am really glad I have found this info. Nowadays bloggers publish just about gossips and web and this is really irritating. A good blog with interesting content, that’s what I need. Thank you for keeping this web-site, I will be visiting it. Do you do newsletters? Can not find it. My husband and i ended up being so thankful Raymond managed to finish up his investigations via the precious recommendations he obtained through your site. It is now and again perplexing just to always be giving freely concepts which usually other folks could have been selling. So we do understand we have got the website owner to give thanks to for that. The illustrations you have made, the straightforward web site menu, the relationships your site give support to foster – it’s mostly incredible, and it is making our son and the family understand the article is enjoyable, which is certainly unbelievably fundamental. Thanks for the whole lot! You are my breathing in, I own few web logs and very sporadically run out from to brand.I think this site holds some very fantastic info for everyone. “There is nothing so disagreeable, that a patient mind cannot find some solace for it.” by Lucius Annaeus Seneca. I simply wanted to appreciate you yet again. I am not sure the things that I could possibly have implemented in the absence of those tips and hints documented by you relating to such concern. It had become an absolute troublesome problem in my position, but seeing a new specialised mode you processed it forced me to weep over happiness. I’m thankful for this support and thus believe you recognize what a powerful job you’re carrying out training the others through the use of your website. Most likely you have never come across any of us. you’re truly a good webmaster. The website loading velocity is incredible. It sort of feels that you are doing any distinctive trick. Moreover, The contents are masterwork. you’ve done a great activity on this topic! It is in point of fact a nice and helpful piece of information. I¡¦m satisfied that you simply shared this useful information with us. Please stay us informed like this. Thanks for sharing. Hello, Neat post. There’s an issue along with your website in internet explorer, would test this¡K IE nonetheless is the market leader and a big component to people will pass over your fantastic writing due to this problem. I wish to express thanks to this writer for rescuing me from such a setting. Because of checking through the the web and getting views that were not productive, I believed my life was over. Living without the presence of solutions to the problems you have sorted out as a result of your good website is a serious case, and the kind which might have in a wrong way affected my entire career if I hadn’t encountered your blog post. Your own skills and kindness in dealing with almost everything was vital. I am not sure what I would’ve done if I had not come upon such a point like this. I’m able to now relish my future. Thanks so much for your high quality and effective guide. I will not hesitate to suggest your web page to anyone who would need guidelines on this subject matter. Thank you a lot for providing individuals with a very terrific possiblity to read in detail from this web site. It is often so pleasurable and as well , full of fun for me personally and my office friends to search your blog at the very least three times per week to read through the newest stuff you have got. And indeed, we are at all times impressed with the excellent principles you serve. Certain 2 areas in this posting are ultimately the most effective we have all had. Its good as your other posts : D, appreciate it for posting . “There’s no Walter Cronkite to give you the final word each evening.” by William Weld. Excellent goods from you, man. I’ve understand your stuff previous to and you’re just extremely fantastic. I actually like what you have acquired here, really like what you are stating and the way in which you say it. You make it enjoyable and you still care for to keep it wise. I cant wait to read far more from you. This is actually a wonderful web site. I wanted to create you this bit of remark to say thanks a lot again considering the incredible tips you have documented at this time. This has been certainly tremendously generous with people like you to allow without restraint what exactly a few individuals would have marketed as an e-book in making some dough for themselves, specifically seeing that you could possibly have done it if you wanted. Those points in addition served as the easy way to fully grasp other individuals have the identical eagerness really like my personal own to grasp significantly more on the subject of this matter. Certainly there are millions of more fun opportunities ahead for individuals that scan your website. I actually wanted to make a simple remark so as to thank you for those superb steps you are posting at this website. My long internet investigation has finally been honored with wonderful details to go over with my great friends. I would assume that we readers actually are quite fortunate to be in a good site with many lovely professionals with helpful tips. I feel truly happy to have discovered the weblog and look forward to many more excellent moments reading here. Thank you again for all the details.